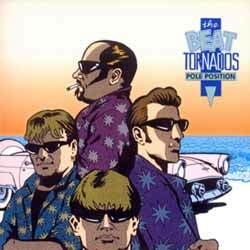 Pole Position is the debut album by the Norwegian surf rockers The Beat Tornados. Pole Position is almost entirely instrumental with the exceptions being the subtle wordless voices on Oppa Fjellet and a quiet yell followed by a much louder one on El Nino. This works to the albums advantage because there isn’t much space for actual singing as the songs take on new directions quickly and aren’t structured with a singer in mind. While all of the songs are up tempo with reverb drenched guitars taking the lead, there is plenty of variety in the song-writing department over the course of this short album. The lazy sounding Kon Tiki is the only slow song on Pole Position and it follows on from El Nino, a song that builds itself into a flurry of cymbal crashes and drum rolls before launching into the optimistic Phin T Dalen that is guaranteed to make you smile. Clocking in at 20 minutes, it’s hard to consider Pole Position to be a full length album but The Beat Tornados offer the listener a great deal of replay value with some excellent musicianship that does everything right without the need for any excess.